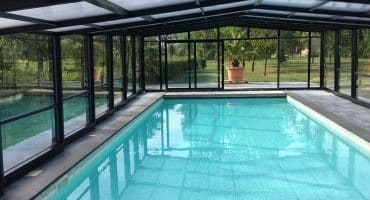 Pool enclosures are one of the 4 measures compliant with the no.2003-9 French law of January 2003 on safety (Official Journal of the 4th January 2003) and two decrees, no.2003-1389 of the 31st December 2003 (Official Journal of the 31st December 2003) and no.2004-499 of the 7th June 2004 (Official Journal of the 8th June 2004). The French law on safety stipulates that all pools for individual or public use must be equipped with a safety feature. Barriers, covers, alarms and pool enclosures are the four approved safety features. Each of these features must be able to prevent a child under the age of 5 from accidentally falling into the pool. Every pool owner should ensure that the selected feature complies with the relevant standard. All our enclosures are compliant the AFNOR NF P90-309 standard on “Protective elements for in-ground, barrier-free, private family or collective use swimming pools – Swimming pool shelters (lightweight structures and/or verandas)”. 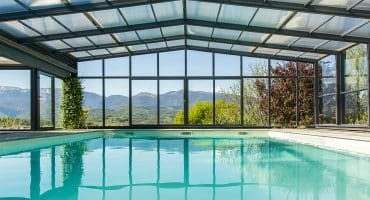 Our products therefore provide levels of wind, snow and fire resistance that are far higher than those required by the mandatory French standard on pool enclosures. No safety device should be considered by parents as an excuse to not keep a watchful eye on the safety of their children. Do not allow an unaccompanied child to access the pool. Always ensure that a responsible adult watches over children using the pool. Get informed on the safety requirements of each safety feature. An enclosure is only fully secure closed and locked with a key. Give children swimming aids such as rubber rings and armbands. Introduce children to swimming from the age of 4 and make them aware of the danger. Keep emergency equipment such as poles, lifebuoys, phones within reach.